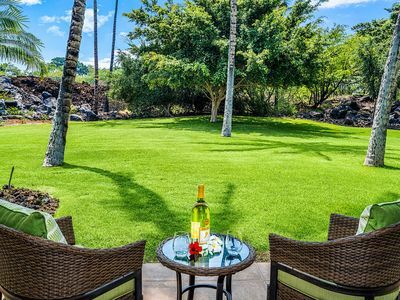 Enjoy two of the world's finest resorts at this 2 bedroom 2 bath luxury ground floor condo at Kumulani at the Uplands of Mauna Kea on the Big Island of Hawaii. 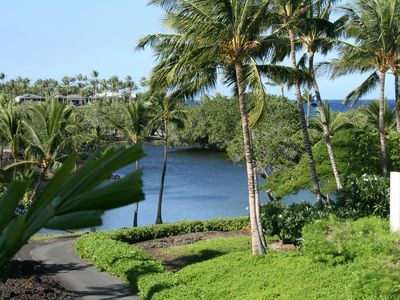 This peaceful gated community is on the Hapuna/Mauna Kea Resort property just above the hotels. 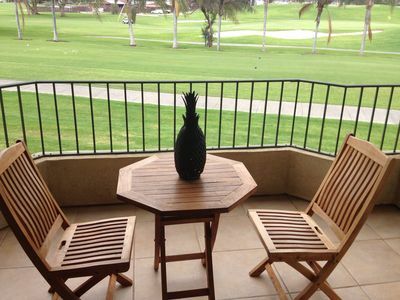 Enjoy beautiful ocean views and sunsets from most of the unit. 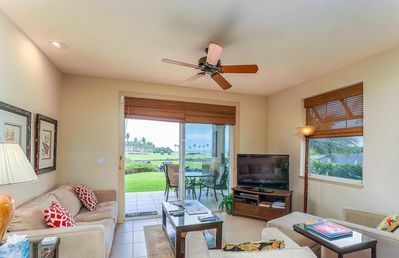 This unit offers the most privacy of any ground floor unit. 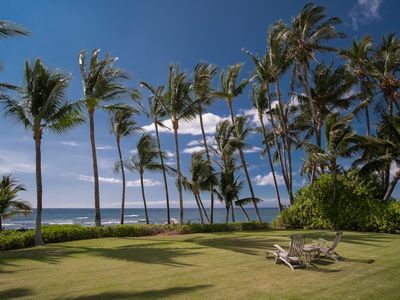 It is perched above and to the side of the pool to enjoy beautiful views from a location with little to no foot traffic other than your own out to the wrap around lanai and grounds in front of you. 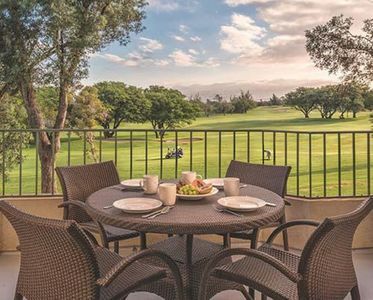 Available with your reservation is an extension of our membership in the popular Club at Mauna Kea Resort, which allows you to enjoy the amenities of both luxury Hotels located here – Mauna Kea Beach Hotel and Westin Hapuna Beach Hotel. 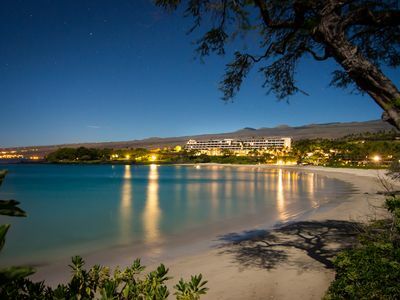 You may choose this for a fee which is paid directly to the hotel with your guest registration that will be sent to you separately (see below) or you may enjoy the world famous Mauna Kea Beach and Hapuna Beach from the public parking access at no cost to you. 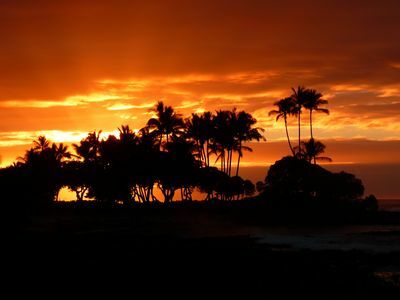 Hapuna Beach has unlimited public access at the South end of the beach and Mauna Kea allows 40 cars per day at the public access parking lot at the South end of the beach. You may email me directly with any questions. Click email the owner next to our photo and I'll write back promptly! We provide you in our unit with beach chairs, beach towels, boogie boards, cooler, and plenty of beach toys for the little ones. A cabinet full of books and cookbooks is provided along with puzzles. 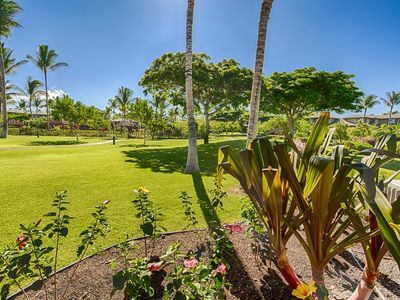 With purchase of the amenity package you have unrestricted access to both the Mauna Kea Beach & the Westin Hapuna Beach Hotel facilities with keycard parking at the private access. 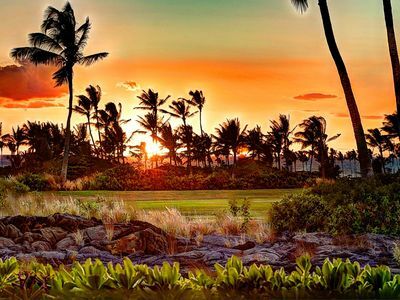 The Mauna Kea/Hapuna amenity package/Guest Registration Fee schedule has been revised per the chart below. 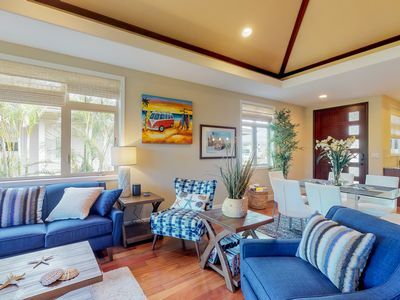 Please note that this is a daily fee per 2-bedroom home/condo (rates are now based on 2, 3 or 4+ bedrooms) up to 20 days and a flat per stay fee for designated periods thereafter. Note all fees are plus tax. This condo sleeps 4. Master Suite has a king bed, TV, large tub, walk in shower and closet. 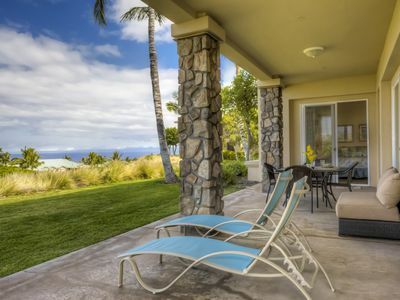 Enjoy beautiful views to the ocean or walk out to the lanai. Guest suite has king or 2 twin beds made to your preference and private bath. 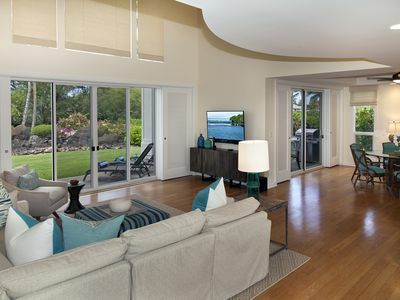 High speed cable with wireless is included along with 2 LED TVs (Great Room & Master Bedroom). A telephone is provided for local calls and free long distance to mainland USA and Canada! Your kitchen is well appointed and fully furnished including many spices and items to cook wonderful meals. We just added a Nespresso and Milk heater/frother to make Lattes and Cappuccinos. So BRING YOUR OWN ORIGINALLINE PODS. 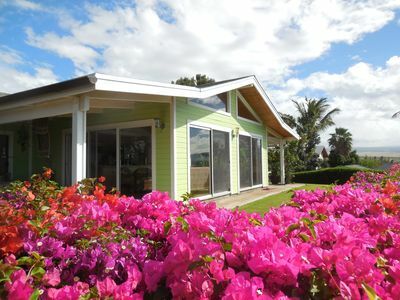 “Da Fish House” is only 5 minutes away where you can purchase that day’s catch and grill up on the Weber gas grill ON YOUR OWN LANAI. 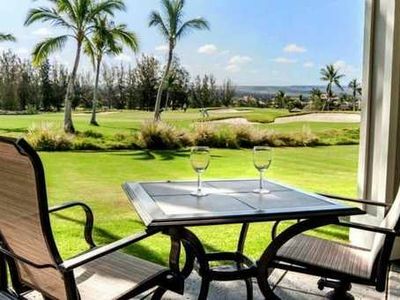 Plenty of fresh groceries are obtained at the nearby Foodland or enjoy the numerous fine restaurants on the hotel properties or nearby. Washer/Dryer along with all products you may need are provided. 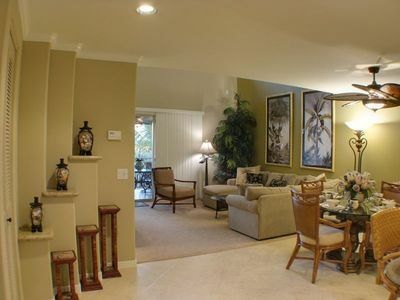 It is fully air-conditioned and has ceiling fans in the great room and both bedrooms. 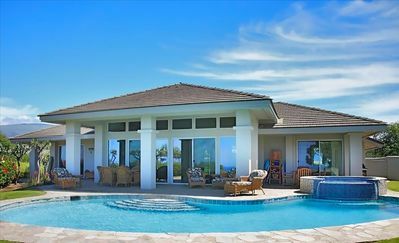 Besides the Club at Mauna Kea, Kumulani has its own private pool and hot tub. 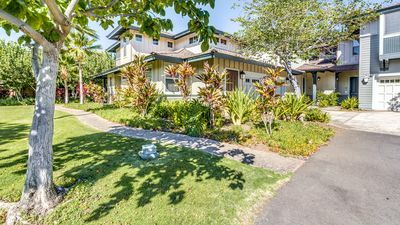 This condo is located 30 minutes from Kona International Airport (KOA) with many upscale restaurants and shops either on the resort grounds or within a short drive. 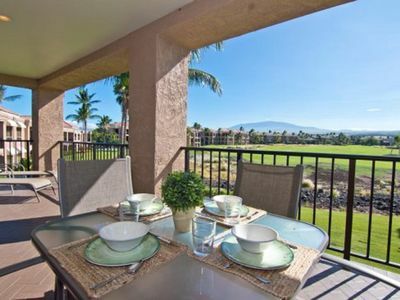 MAUNA KEA BEST VACATION DEALS w/ OCEAN & GOLF VIEWS - Best Price & Free Access! 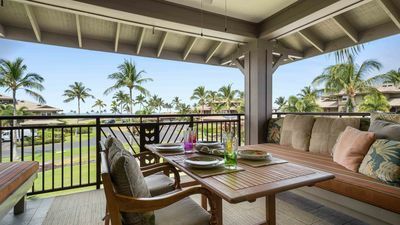 OCEANFRONT Blue as far as you can view from Hali'i Kai 15B! 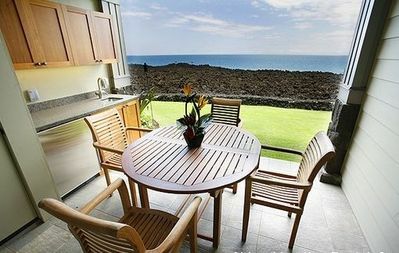 Luxury Ocean View Condo at Waikoloa Beach Resort- Includes WiFi, Private Lanai, AC, Family Friendly!